Najib’s constant reference to riding may well endear him to the blue-collar community, as he attempts to morph into a champion of the working class. 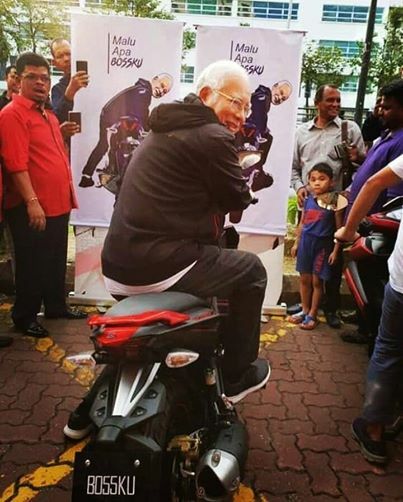 KUALA LUMPUR, Malaysia – Clad in a black parka, black jeans, and black sneakers, Datuk Seri Najib Razak was recorded over the weekend revving up a black-and-red Yamaha Y15ZR 150cc moped that is all the rage with youths now. As he pumped the throttle, the crowd cheered wildly — possibly inscribing a place for the former prime minister in the Malaysian Hall of Memes, and mayhap even back into the hearts of the working class after his fall from grace last GE. The event was staged after a casual meet-the-people session in the Malay-majority suburbia of Shah Alam, which featured a caricature of Najib of riding that same bike — a pose that he later assumed in real life. 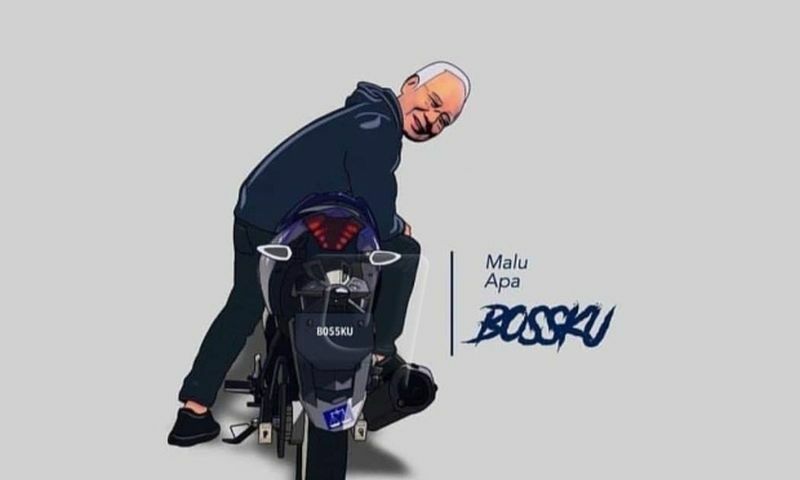 The fact that the event was headlined “Malu apa bossku” (“Why the shame, boss?” in Malay), and the bike’s registration plate — 8805KU spelling out “BOSSKU” — underscores its true genius. “Malu apa bossku” refers to a reply made by Najib in a now viral selfie video of him alongside a long-haired man calling out “Boss kita!” (“Our boss!”), and the phrase has now not only turned into a rallying cry among the supporters of the scandal-plagued Pekan MP, but has entered popular culture. The word “bossku” itself was popularised by the “rempit” culture of working class riders, although it arguably originated from the lexicon of the young, middle-class Malay in Sabah where it is usually intentionally misspelt “busku” or “bussku”. That viral pose with the bike will spread far and wide on the electronic grapevine after Najib posted his photo on his now immensely popular Facebook page. “It’s my post, but others are getting hot and bothered. Why? Steady lah,” he wrote in an update that has been shared nearly 10,000 times and received 11,000 comments. “This hurts, bosku. Other troll pages can no more put bread on the table,” said a top comment in Malay by popular joke page called Si Rashid which has over 650,000 followers. “With this I officially close my Astro subscription. With Najib Razak, I no longer need Maharaja Lawak Mega, you keep us really entertained,” said another top commenter Amirul Aminn, referring to a widely-watched Malay comedy reality TV show. 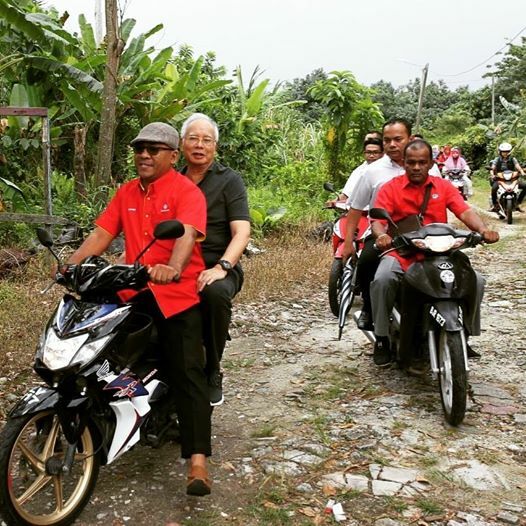 Najib’s flirtation with the “rempit” culture started just a few days earlier. “Between Ysuku and NVX which one is your choice? For a casual ride,” he asked in a one-line Facebook post last Friday which received over 5,000 comments. Ysuku is the slang name for the Y15ZR, while NVX refers to another popular model from Yamaha, a 155cc scooter. It is unknown if Najib is a motorcyclist. In another troll post on Monday where he sought fuel reimbursement from Pakatan Harapan (PH) in a dig at the ruling coalition’s transport payment for its Cameron Highlands volunteers, the 65-year-old was shown riding pillion sans helmet. But Najib’s constant reference to riding may well endear him to the blue-collar community as he attempts to morph into a champion of the working class, a far cry from the scorn after the 1Malaysia Development Bhd (1MDB) scandal broke. The reception he has received recently may seem as if some Malaysians have already forgotten the multi-million ringgit bespoke bags from the House of Bijan he was linked with, and other luxury goods seized from his family residence less than a year ago. Then there was that foodie “lepak” spot in Gombak, and Kerinchi, where PH MP Fahmi Fadzil is trying to address its gentrification. He has also been posting on a daily basis on bread-and-butter issues, highlighting the story of disabled man S. Sukumaran, who now works as a car-washer in Shah Alam. Najib’s topics of choice have ranged from the retail price of fishes, price of food in school canteens, plight of taxi drivers, and the dwindling dividends of Tabung Haji and the Employees Provident Fund. “I feel sad. The people can no longer see the government as a support system. The government no longer has the people at heart,” he wrote this week, when talking about the bottom 40 per cent households. The Pekan MP will now turn his attention to the Cameron Highlands by-election as he seeks to extend his newfound popularity within the working class of the constituency. While most of the nation is more familiar with the holiday destination in the Tanah Rata state seat occupied by PH’s DAP, a vast area that comprises farms, plantations and Felda settlements fall under the Jelai state seat won by BN’s Umno. It has been reported that the “Malu apa bossku” meme may have even made its mark there, especially in the Felda settlements that Najib is expected to visit this Friday and Saturday — the last weekend before Cameron Highlands votes on January 26. However, Najib may want to take it easy with his Facebook trolling. Recent posts may have betrayed his privileged lifestyle. On Thursday, he had posted a photo of buying several cups of Starbucks coffee — drinks usually associated with the wealthier middle class. Another photo of him shopping for groceries a few days earlier with his youngest son Ashman — previously linked to Najib’s quinoa gaffe — was taken at the upscale Mercato supermarket, not Giant, Mydin, NSK, or even Tesco. Born the eldest son of a man who would later become the country’s second prime minister and educated in the United Kingdom before becoming an MP at the young age of 23 and a mentri besar at 29, Najib’s survival may now depend of him living up to that “bossku” image.